What is it about fall that brings out the worst in some people? I love the cooler air and the leaves turning color. Pumpkin lattes and pumpkin scones! I hear they're serving both at The Parlour. Tomorrow I'm starting to decorate the community haunted house. I got out some of my gear and it brought back memories of The Diva Haunts the House. It won't be long until the leaves crunch underfoot and a chill wind blows. When I walk along the brick sidewalks of Old Town, it's almost like that wind carries the voices of those who have gone before. Like they're crowding the sidewalks and brushing past me in the cold breeze. You think I'm exaggerating? There are a lot of ghosts in a place that's over 200 years old. That was the year I heard the legend of Viktor Luca, who murdered a woman under strange circumstances and then disappeared. My former in-laws tried to track him down. I won't go into details, but they flew to Paris only to find-I shudder to think about it. I'm hoping this haunted house will go better. After the mess at The Parlour, I could use a break from murder! 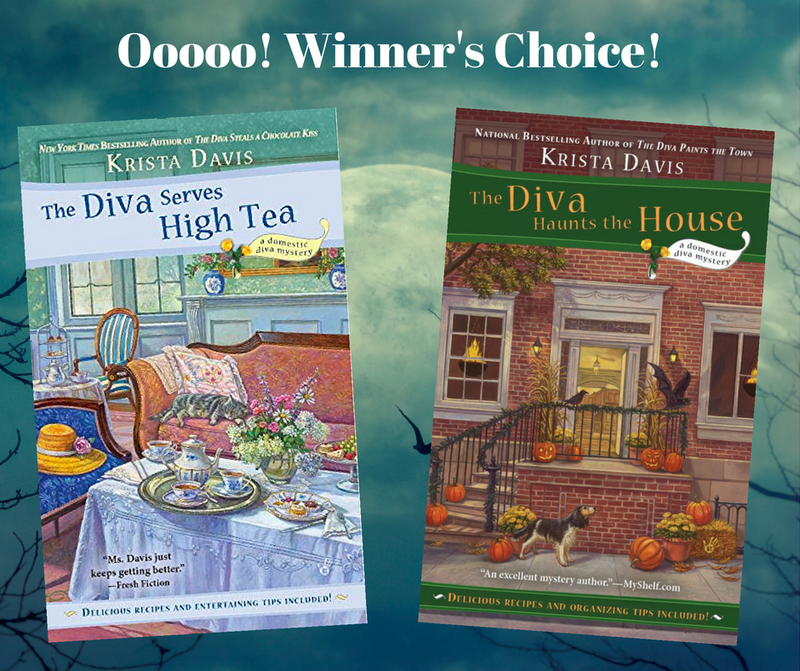 But if you're in the mood for leaves that crunch underfoot, carved pumpkins, and spooky things that go bump in the night, you might want to read The Diva Haunts the House and you could win it here today! To enter, leave a comment with your email address, please, so I can contact you if you win. Which book would you like to read? I'd love to read The Diva Haunts the House. Thanks for the chance! I like to think the cooler fall temps bring out the better in people after a hot summer! Would love to read The Diva Serves High Tea. Thanks for the chance to win! I'm looking forward to The Diva Serves High Tea! Love delicious cozy mysteries. Always like finding new authors and books to read. The Diva Haunts the House would be a good fall read. I'm looking forward to reading this series! Thanks for the chance to win! I am definitely in the mood for The Diva Haunts the House! :D Thanks for the contest. 2boys4me (at) gmail (dot) com. with give me that push. thanks. The second book in the Domestic Diva series is The Diva Takes the Cake. Does that help? LOVE all of your books, and would be thrilled to win either one! Thanks for the opportunity! Congratulations, KKAT! You're our winner! I would love to read The Diva Serves High Tea. The Diva Serves High Tea, please. This series looks great. Thanks for the chance. Diva Haunts the House sounds like perfect fall reading. I'd love to win it. Diva Haunts the House, please -- it sounds intriguing! I have not yet read the series, but if I had to pick it would be The Diva Serves High Tea. 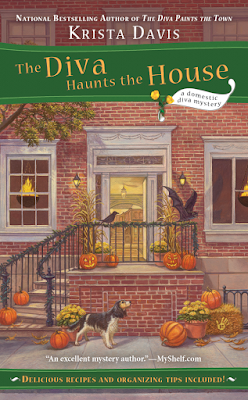 I would really love to read "The Diva Haunts the House". Sounds like a great read for Fall especially around Halloween. Thanks for the chance. I can't wait for the Halloween season! I have been buying Halloween fabric since Easter to make table runners, wall hangings, quilts, etc. Would love to read "the Diva Haunts the House. Thanks! j[dot]marshall730[at]yahoo[dot]com. I would love to win either book, but I guess I will choose The Diva Serves High Tea. Thank you so much. Just finished The Diva Serves High Tea, LOVED IT!! Would love to win Haunts the House. Thanks for the chance. THE DIVA SERVES HIGH TEA would be great thank you. I love Halloween type mysteries and this one sounds great. I would like The Diva Haunts the House please and our weather has just a hint that fall is coming. I cannot wait. Thank you for the chance. I would love The Diva Serves High Tea. Thank you for the chance! What a marvelous series! I would love to read "The Diva Serves High Tea." Although, Fall and Halloween is right around the corner, I can't pass up a high tea celebration. 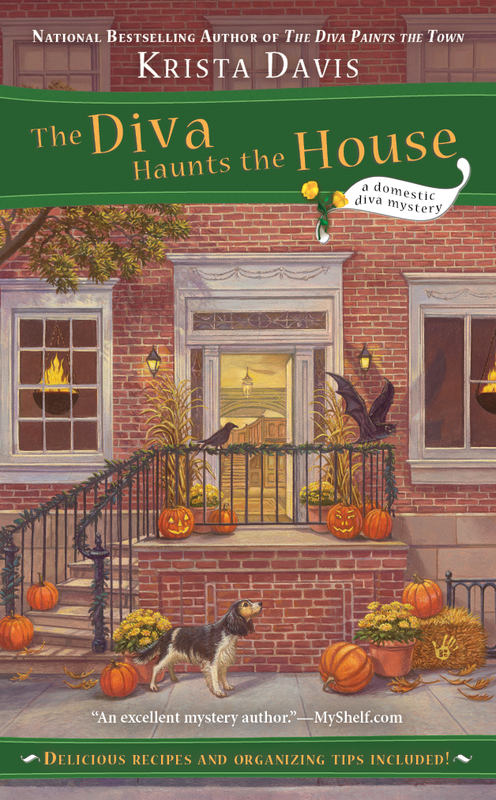 I would love to read " The Diva Haunts the House". Love the cover☺️☺️☺️. Thanks for the chance. Ooh, it's getting to be the time for ghost stories! I would love to read "The Dive Haunts the House." Thanks. I love your series and would love to read The Diva Serves High Tea. I would love to read either of them. Thanks for the chance and the offer of a choice.